At 3am day 2 of our elk hunting trip arrived. This wasn’t just going to be day 2. This was going to be MY day! My husband, Dave, had already gotten an elk the day before. That meant that if we saw an elk, it was mine. Would it be uphill? Downhill? Close? Far? Everywhere I looked I wondered if I would be able to make the shot if there was an elk standing there. And that “IF” was the biggest factor. 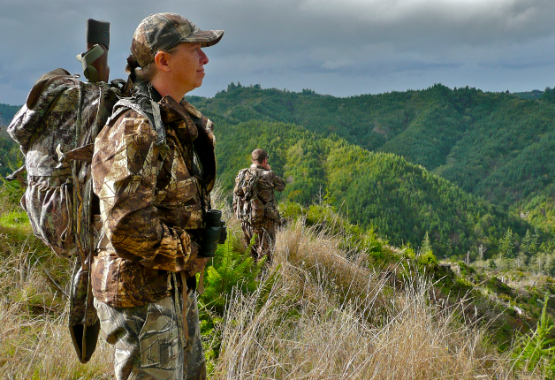 80% of the hunters in the unit would not fill their tags. We got lucky the day before. Would we get lucky again? COULD we get lucky again? The odds were strongly against it. This was more nerve-racking than I thought! We hiked up a long hill and along a ridge looking for elk in every opening we could find. We glassed hillsides and valleys, tree lines, streams and wallows. Elk tracks and droppings literally littered the trail we were on. It looked like an entire herd had moved through either earlier in the day or the night before. We were so close and yet were not seeing any actual elk. Dark storm clouds were moving in and the wind was picking up to a point where I was thinking it could seriously impact my shot…. IF I got a shot. My hunt was being threatened by weather. odd saw that I was getting tired so he sat us up on the top of a hill and had us glass a couple of tree lines while he went ahead to scout another area up a steep hill. 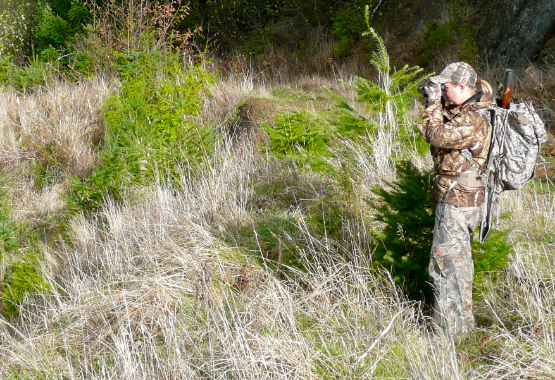 I sat there for a while propped up against a tree looking through my binoculars for any sign of elk. Nothing. The wind grew stronger and began to dry out my eyes, making it hard to see clearly. A few threatening drops began to fall from the sky and as I bundled up I realized that the last bit of good weather was about to pass. Todd came back from his scout, but the only significant signs of elk were on the trail behind us and right where we were standing. Where were they? The light was going to start fading soon, so we headed back down the trail towards the truck, looking for elk along the way. When we were almost to the truck, we stopped and took one last look across a valley and along a hill for elk. I saw a brown spot and picked up my binoculars. The spot had antlers. “ELK!” I yell-whispered to Todd as I tapped his shoulder and pointed excitedly. He saw them too. “Oh man! There’s two and they’re big bulls!” he said. I threw my backpack on the ground and got out my gun. We stacked up the packs and I laid on my stomach and rested my gun on the packs and waited for my shot. “200 yards,” my husband said. I took aim. “Wait for him to turn,” Todd said. “You’ll get a better shot. Just be patient and wait for it.” He was right and I did. Finally the bull turned and my shot opened up. Todd said, “Now… slowly pull the…” BOOM! I assumed the next word was going to be trigger and so I pulled it. I hit him in the shoulder, the bullet going through both lungs. He stood there for about 3 seconds and then fell over, tumbling down the hill, taking out trees as he went. When we got to him he was beautiful! I had just shot my first elk and I was about as excited as I get. He was a 5×6 and had a HUGE body! He was a fighter for sure and had spent an awful lot of time rubbing his antlers. As for me… I was grinning from ear to ear. 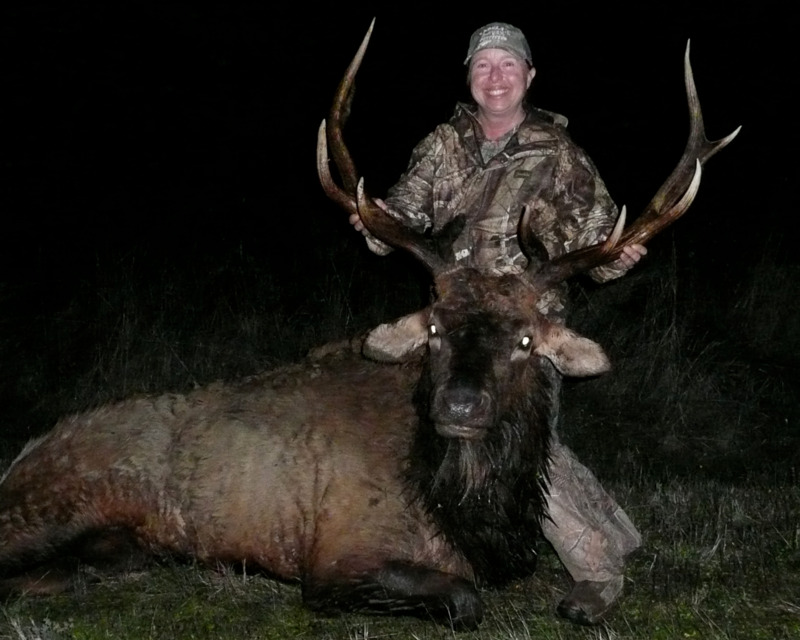 In the end, thanks to Todd, the owner of Grassy Knob Guide and Outfitters, we got two elk in two days. 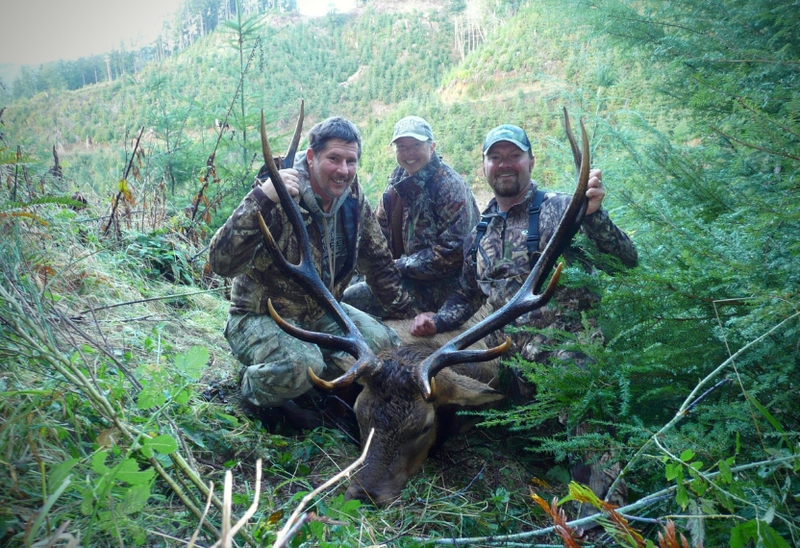 But we didn’t just get two elk… we got MONSTER elk! We got once in a lifetime elk. How cool is that?! Could I ask for a better story for my first elk hunt? No. No I could not. It was perfect. Thank you for the adventure, Todd! It was fun!